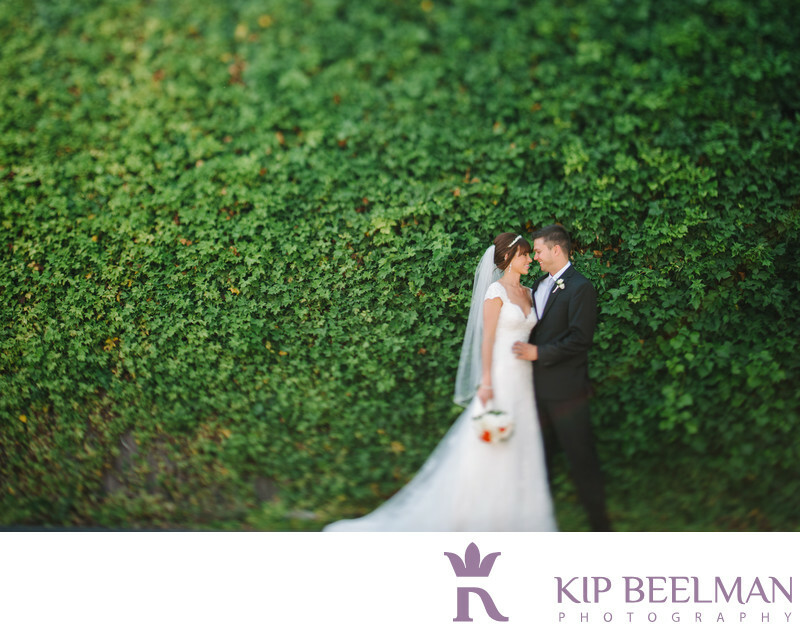 I created this soft, lush image of a beautiful couple on their wedding day with a 45mm tilt-shift lens. A tilt-shift is a unique lens that is often used in architecture and product photography, where the focal plane is skewed. Used sparingly, it is an effect for portraits and environmental shots that I love, and the couple loved this look as well for their Pan Pacific Hotel wedding photography. The Pan Pacific Hotel is located in the booming South Lake Union neighborhood, right in the heart of downtown Seattle, and provided amazing scenery and service throughout the grand event. The couple spent the day getting ready there, and the floor-to-ceiling windows in their stylish suites provided gorgeous light for those first photos. They enjoyed their first dazzling look at each other and first steps toward each other on the sweeping staircase of the hotel’s entrance, and the hotel’s town car took us on a portrait tour of nearby Lake Union, which provided more lovely views and moments. The family and wedding party then met us at nearby Denny Park for some more pretty portraits. After the sweet wedding ceremony, the couple and their guests enjoyed cocktail hour on the hotel’s terrace with sweeping views of the Space Needle and Olympic Mountains – and each other. The reception was held in the classic hotel ballroom, brimming with Pan Pacific elegance, wedding photographs to remember, close embraces and wide smiles. From this photo through the last dance, this wedding provided color and connection and celebration. Location: 2125 Terry Avenue, Seattle, WA 98121. Keywords: Hotel Wedding (48), Seattle (111).